Please enter accurate information on the intended use of the resin using the drop down box choices for each selector question below. What is the Main Material? What is to be fixed to the 'Main Material'? What is the intended use of the resin? What will be the installation temperature? Are any of the surfaces to be bonded very smooth or a 'diamond bit' drilled hole? Choose an option Yes No I'm not sure! What loading will the resin be subjected to? Choose an option High Loading (IE Anchor Fixings ETC) Low & Average Loading (IE Brick repair - Crack Stitching - Crack Repairs) I'm not sure! Do you require a best available Test Certified Product with long life guarantee? Will you be using the resin indoors or a confined space with poor ventilation or require a 'LOW' installer hazard rating? Where will the resin be applied? Is some curing shrinkage acceptable? Yes No I'm not sure! Will the resin come into contact with aggressive liquids & chemicals after curing? Will the resin come into contact with salt water after curing? Do any materials to be bonded contain or are surface contaminated with lime or lime mortar? Are the materials which are being bonded wet? Are you concerned with purchasing an environmentally friendly product? Is the colour resin essential? Do you need a resin which is good for close edge or close spacing applications? No Yes I'm not sure! Will the long term environment temperature regularly exceed 50 ° C (122 ° F)? Based on the information provided above, the suitablitly of our resin range is indicated below. Disclaimer: This selector is offered in good faith and should enable a suitable selection of resin for most uses. If your requirements are unusual or do not exactly fit the selector options OR is critical to safety OR is part of high value work then we recommend you take expert advice. The maximum liability that will be provided by SkilledBuild to users of the resin selector for incorrectly specified product is the refund of the product cost up to £500.00. Acceptance: Use of the selector is acceptance of these limitations and those stated in the ‘how to use’ section. The SkilledBuild Resin Selector is a tool designed to aid a choice of resin or grout for general minor repairs. The selector is specifically created to match SkilledBuild products and must not be used to judge the suitability of any other supplier’s products. Best results will be achieved by imputing data for each particular bond, rather than attempting a composite entry. For example - If the task entails resin fixing of metal wall-ties to a cavity wall by connecting an inner concrete block wall to a masonry outer wall - it is recommended you test the suitability of the materials separately. IE. Test 1 - Check 'Aerated Blockwork' with 'Metal Fixings' and also, Test 2 - Check 'Masonry' with 'Metal Fixings'. This will maximise the accuracy of the suitability result and ensure that all the relevant information and tips text is available for the installer to read. Always ensure that the Selector is ‘Reset’ with no prior choices remaining. Clear previous choices clicking one of the orange ‘Reset’ buttons. Required Questions. There are a number of questions for which selections MUST be made before the Resin Selector will present a table of graded product choices. Read each individual Required Question and select the orange triangular button to the right to reveal a dropdown box of available choices. Highlight and select the choice relevant to your circumstances. Your choice should now appear in the selection box. Continue until you have made selections for all Required Questions. Now you will be able to use the orange ‘Select Me A Resin’ button to open a ‘Results’ table beneath. The table will display the suitability of the various products in the SkilledBuild range to match your need. Optional Questions. SkilledBuild strongly recommends that you spend an extra few seconds to complete this section. Optional Questions are revealed by highlighting and selecting the blue 'Optional Questions' bar. The selection boxes to the right hand side of each question are pre-populated with default responses. Read the questions and consider the default responses. If the application differs to any default response, click on the orange triangular button to reveal additional choices and select as appropriate. Change as many of the default choices as required. Now use the orange ‘Select Me a Resin’ button to open a Results Table beneath. Results Table. The Results Table will appear beneath the Optional Questions section - you may need to scroll your browser to view. The table displays all SkilledBuild Epoxy Resins & Grouts along with a colour coded suitability rating. Ratings appear in a box to the right of each particular resin and its likely suitability is indicated in the colour matched headings. ‘Purple’ rating box indicates that the product is likely to be highly suited for the task described by your choices. ‘Green’ rating box indicates that the product is likely to suit the task described by your choices. Products with a 'purple' grading are considered to be more suited or superior in performance for the task. ‘Yellow’ rating box indicates that the product is fairly suited for the task described by your choices but it is not ideal. SkilledBuild recommends that if other products graded as ‘Green’ or ‘Purple’ are available then these should be used. ‘Red’ rating box indicates that the product is unsuitable for the task described by your choices. SkilledBuild strongly advises against use for the intended purpose. Proceed to purchase by using the BUY button to the right of the chosen product - This transports you to the relevant product page. Before selecting the BUY button, SkilledBuild recommends that you 'click' on the product name in the left hand column of the 'Result Table' to reveal a listing of information and tips on using that product for the specific task you outlined in the choice sections (see below). Now for the clever bit! Selecting (left mouse button 'click') a particular product name in the left hand column of ‘Results Table' will open up a pop-up box displaying full details of all your question responses and that products specific suitability rating for each of those individual response. The unique algorithm developed by SkilledBuild to power our Resin Selector is complex but generally the overall suitability grading appearing in the ‘Result’ table will reflect each products worst rating for any of the single question responses. It is therefore possible that a product may be suitable for your specific use except for a failure of just one single criteria. For example, a resin may be graded overall as ‘Unsuitable’ due to the selection of a low temperature option, whereas it may have been graded as ‘Most Suited’ had the installation temperature been a few degrees higher. Being able to identify the specific grading for each question response may allow changes to be made to enable a particular product to become suited for use. In our example above, the installer may have varied the temperature question choice in the selector to reveal that by raising the temperature the chosen product is now rated as suitable for the intended use. If the installer then ensures that both the ambient and material temperature is raised to the required temperature, that product can be successfully used. Another example may be that an otherwise suitable product scores as ‘unsuitable’ because the materials to be bonded are damp. Knowing this, the installer may be able to dry the materials and then successfully use that product. This may allow the use of a cheaper resin or one previously purchased by the installer thus saving money. 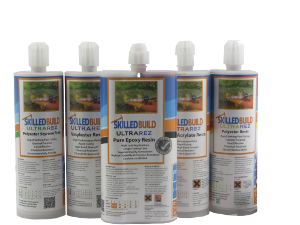 Why not check out all the detailed pop-up boxes for each of the SkilledBuild Epoxy Resins and Grouts to increase your knowledge of the strengths and limitations of each product. As described above, highlighting and selecting a specific resin name in the ‘RESULTS’ table will open a pop-up. Below the table is an ‘Important Notes’ box containing both general and specific information related to that specific resin and the intended use. Scroll down the pages as required and read fully as the information does not appear in any order of priority. This information may be crucial to the successful use of our product. Now for the responsibility bit. The Resin Selector is designed to provide a general guide only for the suitability of SkilledBuild products based on the input information. The selector is not a professional specifying tool and must not be relied on for tasks were a failure in the works will create safety risk or high repair costs. SkilledBuild is committed to development and supply of quality products. Due to continuing development the supplier reserves the right to substitute or change product branding or specification or technical data without notice. The data and selection criteria contained within the Resin Selector may be updated regularly. Please check for updated information before each use of our products. The information provided by the Resin Selector is based on practical tests & published data and has been reviewed by our resin manufacturer. The selector is a free tool intended to aid a competent DIY user or contractor in the typical use of supplied products for minor low risk repairs. All information is provided in good faith and without any guarantee. In all instances where a failure in the work will prove costly to repair or create potential harm to persons then design and execution of the works must be undertaken by competent persons. If any further advice is required please consult a suitably qualified advisor. SkilledBuild technical Department may be able to answer simple product enquiries. Since application and working and competence of the user are beyond our control, no liability of the supplier can be derived from the contents of the Resin Selector and information sheets or any other general information provided. Any statements made beyond the contents of SkilledBuild’s website or product labels must be confirmed in writing directly from SkilledBuild. SkilledBuild is not responsible for installers Health & Safety – That is your own responsibility. We do recommend use of the correct H&S equipment (PPE) at all times and adequate ventilation of the workplace to minimise the installers inhalation of dust and fumes. Polyester Resin (and Pure Epoxy to a lesser degree) must not be used in confined or unventilated areas. DEFINITION: ‘Select' or 'Selecting' or 'click’ = Highlight a button (or wording) by moving your cursor over the target and then depressing the left-hand mouse button once. Use of the SkilledBuild Resin Selector Tool is acceptance of all restrictions, limitations, Terms & Conditions connected with this tool as contained in this document and other pages of the website.